The marijuana legalization movement may seem like a grassroots campaign, but a little digging reveals there have been some big bucks behind it. According to The Washington Times, the big money behind the recent push for legalization around the globe has come from a few very wealthy individuals with links to Big Ag and Big Pharma. Chief among those is George Soros, a major shareholder in Monsanto. Because it is now well established that cannabis is a cheap, effective and natural alternative to pharmaceuticals for an endless list of medical conditions, Big Pharma knows it represents a potential new multi-billion dollar industry. Critics of legalization have warned it could open the door to genetically modified, patented varieties that could squeeze growers of natural and organic cannabis out of the market. Monsanto has denied it is working on GMO strains, but Seeds of Destruction author William Engdahl presents compelling evidence to the contrary. In an article titled “The Connection Between the Legalization of Marijuana in Uruguay, Monsanto and George Soros,” Engdahl exposes Soros as an instrumental player in legalizing marijuana in Uruguay in 2014. He also provides a timeline of suspicious events leading up to the recent Monsanto-Bayer merger. In 1990, the Dutch company Hortapharm created the world’s largest collection of Cannabis seed varieties. In 1998, the British firm GW Pharmaceuticals bought the rights to use the Hortapharm cannabis for their research. In 2003, Bayer started conducting joint research with GW Pharmaceuticals on a cannabis-based extract. 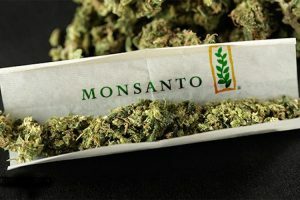 In 2007, Bayer agreed to an exchange of technology with Monsanto, giving Monsanto discreet access to Bayer’s research on genetic modification of the cannabis plant. In 2009, GW Pharmaceuticals announced it had successfully created and patented the first GMO strain of cannabis. In 2016, Monsanto approached Bayer with a joint venture proposal concerning its crop science unit. In 2018, Bayer bought Monsanto for $66 billion. Now that Bayer and Monsanto are on the same team, they are able to share their production secrets and grow together as a mutual business. Bayer brings GW Pharmaceuticals’ already-patented cannabis to the table, and Monsanto brings its partnership with Miracle-Gro, which has already purchased three of the largest cannabis producers in the business. Bayer-Monsanto could create a monopoly on marijuana seeds in the same way we have seen them do with corn and soy. They have an incredible amount of corporate power and through enforcing international patent law, could end up with total control over the cannabis industry, Brown and Engdahl warn. For that, the plant would need to be legalized but still tightly controlled, Brown says. Competition could be suppressed by limiting access to homegrown marijuana; regulating production, sale and use, and defining industrial hemp as having such low levels of psychoactivity that only GMO versions qualify. “Those are the sorts of conditions that critics have found buried in the fine print of the latest initiatives for cannabis legalization,” Brown says. Uruguay’s President has already made it clear he wants a unique genetic code for cannabis in his country in order to “keep the black market under control,” she notes. It’s important to note that patients who use cannabis to heal serious disease, find the natural plant grown organically in sunlight is far more effective than pharmaceutical cannabis derivatives.